Not long ago, on a summer jaunt to the northern border of the U.S., my husband Donnie had the impulse to take us on a quick run into Canada, drawn by a sign for The International Peace Garden. Established in 1932, this over 2,300-acre scenic park spans two countries, with lovely well-coiffed gardens, pools, and statuary. One feature of the I.P.G. that interested us was the North American Game Warden Museum, established to honor the knowledge and bravery of those intrepid workers. There we were surprised to see the stuffed remains of numerous animals, including several bears. 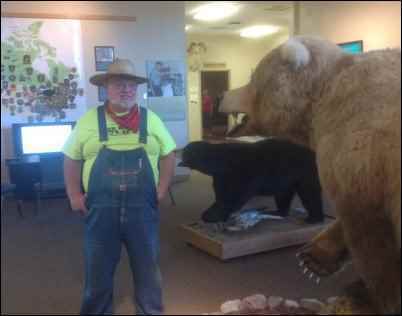 Never one to resist a chance for conversation, Donnie began talking to the patient women at the museum’s front desk who explained that the bears and other stuffed animals were made from pelts confiscated by alert game wardens from perpetrators sneaking them illegally across state and national borders. Native Americans revered the bear as a symbol of power, authority, and, not too surprisingly, of motherhood. There are few animals whose mothers appear so loving, trusting and, well, human, as bears. Images of a mother bear and her cubs loping about in the wilderness, tussling and rolling in the snow or on the forest floor, penetrate our unconscious need for the closeness of family. The mother bear makes herself a complete model for her offspring—showing them by example how to hunt, climb, run, hide, and if necessary, fight. Let’s begin by getting the teddy bear nomenclature out of the way. Yes, it was inspired by Teddy Roosevelt, and various legends abound as to the exact incident that spawned its origin. The story goes that on a game hunt, everyone had gotten a trophy of some kind except Theodore, so his friends chased up a sickly young bear and tethered it to a tree to make an easy shot for the politician. But he did not wish to claim game by unsportsmanlike means, and refused to shoot the bear. This story made the rounds including a cartoon for the press. Serendipitously, two famous toymakers, Richard Steiff in Germany and Morris Michtom in the U.S., were working on toy bear designs, and the name Teddy stuck. 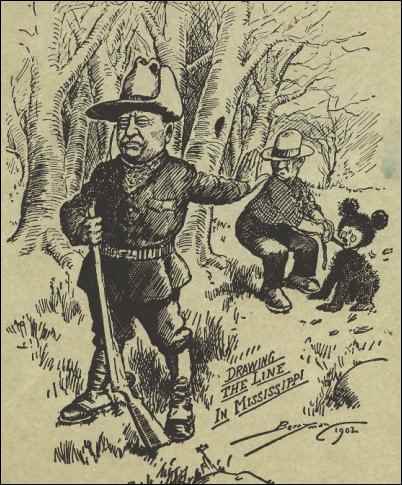 Teddies became fashionable, so much so that Roosevelt (who, it was said, hated being called Teddy) adopted a bear as a mascot to increase his popularity among the voters. The back-story to the generous savior Theodore is the naturalist and hunter Theodore, who saved the bear by not shooting it, but by having it “put out of its misery” with a knife. Some sources swear that Theodore later ate the bear… not sure of the veracity of that part of the legend. 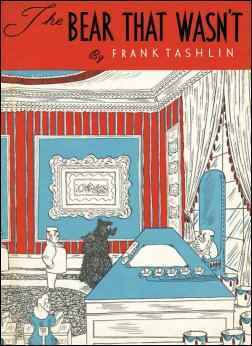 Later versions of the story morphed the single mangy ursine into a she-bear with a shivering cub, and it was this fantasy of the cute cub and its rescue by a benevolent American president that launched the bear as an object of our compassion, a symbol of our collective guilt as hunters and our collective longing for reconnection with nature. One effect of Teddy-ism, if I may call it that, is to de-claw the bear. That is a danger because children (and adults) should never trust real bears, as some people have found to their extreme peril. Death by bear averages about one per year for black and brown bears in North America. These deaths appeared to have been mostly territory-based, and horrific. But… one per year (never any mass murders among the ursine attackers) may stack up as pretty slim odds compared to how many bears we humans destroy per year—estimates are that we kill 40,000 bears a year legally, and another 40,000 are poached, many “harvested” for body parts. Bears are omnivorous, their meat-eating being mostly opportunistic. They are frugivores, but not exclusively. As every child knows, it’s funny how a bear loves honey (and will eat the bees as a side dish). They like acorns, berries, carrion, corn, fish, frogs, fruits, grasses, grubs, honey, insects, larvae, leaves, nuts, peanuts, reptiles, roots, seeds, small mammals, soybeans, and wheat. Their poop spreads seeds and their roving habit makes this a very useful attribute. Bears also kindly regulate the size of moose and elk herds when given the chance. On New Year’s Day this year, Donnie and I were day-tripping near the Blue Ridge Parkway. Cruising the back roads as is our wont, we kept coming around curves (there were many) to encounter, on the verges, the following scene: a pickup truck or two with a cage on the back containing large, dark faced flop-eared hound dogs poking their heads out. There would be two or three men in woodsy camouflage garb, standing around, serious faces engaged in chat. These were parties of black bear hunters. January 1 was the last day of the local bear hunting season. But wait, don’t bears hibernate in the winter? You can’t shoot a sleeping bear in its home, can you? I checked on this. 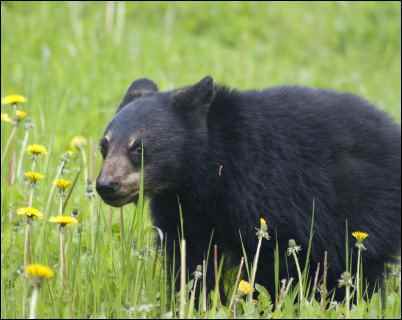 Male black bears in warm climates don’t necessarily have to hibernate, though females and cubs do. The sleepy males that are stomping around the Blue Ridge are easy prey, which kind of takes the sport out of it, surely. They may be baited (we will examine this pernicious practice later), or pursued by baying hounds and ultimately, felled with bullets, or the very lethal modern bow and arrow. In spring, the ursine females and young’uns—self-sufficient to a degree that you and I as mere human homesteaders can only dream of—emerge to forage, beg, steal, and sneak about exploring campsites and garbage cans, as only a critter weighing up to a couple hundred pounds with a well-respected reputation as a wrestler can do. It’s hard to say “no” to a bear who wants your marshmallows. 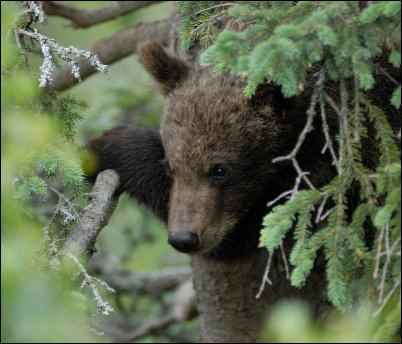 The National Park Services have various answers to “What do you do if you see a bear?” If the bear is very close, scaring it with loud noise is recommended; if it is 50 feet away or more, don’t narrow that distance. Like our forebears (oh, what a choice chance for an un-bear-able pun), folks today still hunt bears, in their season, eat their flesh, and flay their thick fur-covered hides for rugs. Bears in North America, apart from the polar bear, are not considered endangered; seasonal hunting is allowed almost everywhere they range. But there is a more pixilated story of the lives of bears, and the threats against their species—one with fewer laughs. 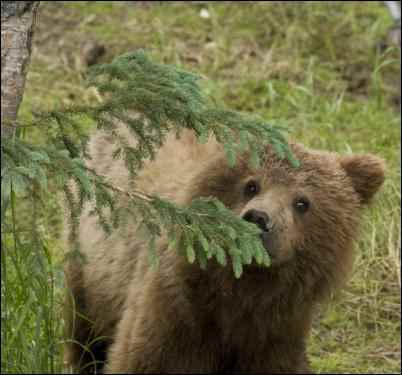 Bears fascinate humans. Unlike other animals that man likes to hunt, bears, when cornered, stand on their hind legs and fight like people, though with considerably greater assets in terms of weaponry—weight, long claws, long reach, and razor-sharp teeth. Just being thrown around by a bear can kill a strong human. This ability to stand and “fight like a man” may have accounted for their totem status among native tribes. Perhaps, too, because they do stand up, men have regarded them as “fair game” to be eliminated as a proving exercise. And fair game to tease, mock, torture, injure, maim, dismember, and disembowel. And fair game for the ultimate trophy, so beloved of comedic movies—the bear’s head mounted over the mantelpiece. 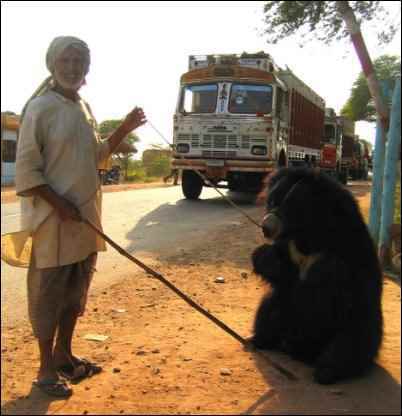 The practice of training bears to dance is ancient, springing from India where it is still extant though decried by animal rights activists. In medieval times, innkeepers would keep a dancing bear as an attraction to bring in business, and carnivals often featured them. 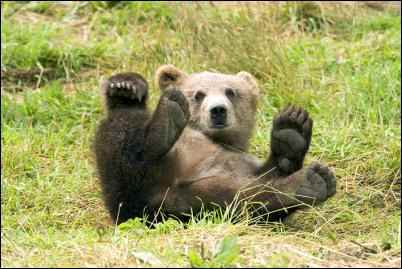 Dancing bears were (and still are) captured as cubs, usually fitted out with a nose-ring (ouch!) and made to stand on their hind legs, sometimes in humorous costumes, and “dance,” led by their keepers. Exotic bears in other parts of the world are all considered endangered. One reason is the harvesting of the animal for parts. Unfortunately this cruel practice also extends to our brown and black Teddy bears. Like rhinos and other animals, bear parts are associated with alternative medicinal practices, especially in Asia. Bear bile contains ursodeoxycholic acid (UDCA), said to be useful in treating hemorrhoids, sore throats, sores, bruising, muscle ailments, sprains, epilepsy, etc. But it is well known, too, that bear body products are also particularly prized as aphrodisiacs. There have been “snake oil” salesmen probably as long as there have been snakes, promising miracle cures and throwing out hints to insecure or aging males for a revitalization of their private parts by the infusion of animal guts with mysterious phallic powers. Is your herbal Viagra experience worth the life of a bear? Answer: yes, to the vendor. That’s why in Asia, you may see “farms” where bears up to the age of five are kept in small pens, their bile siphoned off by needle or catheter at daily intervals. Bears older than five, depleted and degraded by these treatments, are sold for meat and other body products. Bears, by the way, can live up to 30 years or more in their natural habitat. Equally reprehensible is the harvesting of bear paws, considered a gourmet delight. Bear baiting is a term that has a double meaning. For years of human history, right up until the mid-1800s, baiting bears was considered a corking-good spectator sport, a test of canine and ursine combativeness, strength, endurance, claws, and teeth. The bear was put in an arena to fight it out with the local dogs, the English Bull Dog being a local favorite. It was not a spectacle of which it could be said, “no live animals were hurt to bring you this afternoon’s entertainment.” Dogs were killed by the bear, and bears were ripped apart in slow, nasty slices. Bulldogs are known for their ability to hang on to their prey, and it was considered amusing to watch the wounded, angry bear struggle to shake off his attackers. Puritans should be congratulated for deploring and speaking out against this horrific display, but bloodier minds than theirs kept the sport alive. In our supposedly more enlightened times, bear baiting has a new, but arguably more deadly meaning. A well-established practice in many states, though banned in others, it involves leaving out a cache of food that bears like to eat, waiting for them to find it, then shooting them at point blank range as they feed. Hmm. Perhaps you are thinking, that doesn’t sound very “sportsmanlike.” Not exactly the “fair fight” rules agreed upon by my husband and the feisty ladies of the Game Warden Museum. 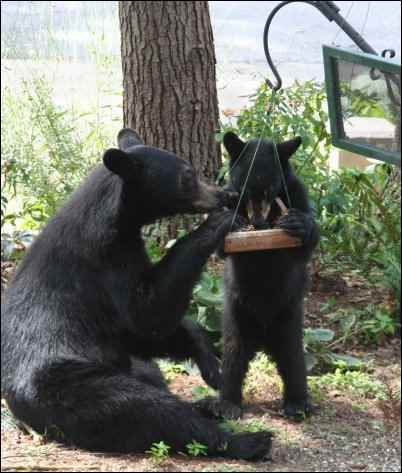 This version of bear baiting is said to create “nuisance bears” by attracting them to human food and passive feeding sites. And there’s more… modern American bear hunting may also include “baying” or “hounding,” in which dogs are encouraged to surround and harry the bears before they are killed by hunters—as savage an amusement as in days of olde. While recognizing that bears and other beasts that tend to find human territory to their liking must be controlled, and that such control can and will probably always include killing, isn’t it still rather, well, primitive of us humans to torment a bear for sport or imprison it or strip it down purely for saleable parts? In fact, isn’t it surprising that such practices yet abound in our wonderful homeland? I think so. Poor old Teddy, how much can he bear? Don’t leave birdfeeders outdoors from March through November. Or, do hang them at least ten feet from the ground, trees or structures. Instead of using birdfeeders to attract birds, try a birdbath. Wait to feed birds until the winter months when they need the extra food and when bears have gone into hibernation. Don’t compost outdoors. If you do, consider installing fencing around the pile. Secure garbage and keep it indoors until the morning of pickup instead of putting it out the night before. 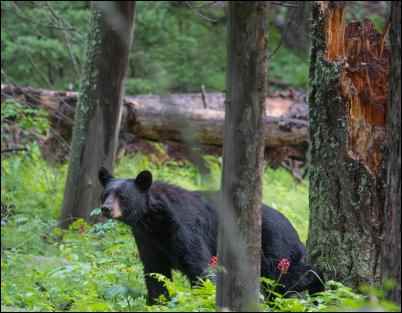 Replace regular trashcans with bear-proof trashcans or a dumpster. Keep garbage cans clean and deodorize them with ammonia. Harvest fruit from trees before or as soon as it is ripe and don’t leave fallen fruit on the ground. Clean outdoor grills after each use. Do not store food or groceries in your vehicle. Be aware—some communities that are located in bear territory will prosecute humans for persisting in bear-friendly practices. If you want to help bears and honor the good name of Teddy, join the Humane Society, World Wildlife Federation, or any of the many organizations trying to keep us safe from critters without destroying our wildlife through senseless cruelty or plain old ignorance. And that’s my flower for the peace garden. Good night, Teddy. Hibernate well.